Ah, Times Square. You know, at Yale, when friends or acquaintances would talk about New York, they would say, "It's great, but I hate the touristy areas." I always nodded my head in agreement. The implication was that they were too noisy, too cramped, and too fake to be of any value to us, future i-bankers and consultants of the world. 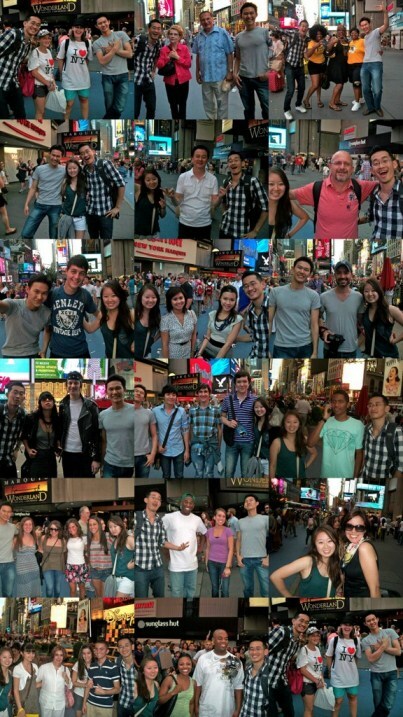 I guess now's the time to admit that I love Times Square -- because of the tourists. They're not New-Yorker-jaded, and as a result, the area is buoyed by an omnipresent sense of wonder. The surrounding stores are a microcosm of New York diversity, owing to the amalgamation of high-end brands, low-end tourist shops, and street vendors. Moreover, the area is light and bright, perpetually open and on -- exactly the medicine I need to combat my introspective nature. One of the reasons I love New York is the relative anonymity it affords. Riding the subway, walking the streets, riding the elevator -- every day, I see thousands of faces I never see again. I mainly look for emotions; while there's a fair share of steely-eyed, glazed-over unawareness, there's also more an abundance of joy, sadness, frustration, and excitement. Times Square is the epicenter for this: every emotion on a smattering of the world's faces. How can it get better than that? The picture above? Here's a story of how inviting tourists can be (just try doing this in Union Square, or Herald Square, or, *shudder* Soho). A group of friends visiting from Yale, U Mich, and Wash U met up at the Met. We walked around, licking the Van Gogh, cutting the line for the McQueen, taking flash photography of the Pollacks, and eventually ended up outside on the steps. Christy and I (we had already blown air at a little boy; don't ask) approached a Korean 20-something and asked if we could buy his hat. He was extremely receptive to our advances, so, feeling particularly egregious (socially, that is), we decided to expand our talking-to-strangers bit to Times Square. "Hi, sorry, can we take a picture with you?" "Oh sure, give me the camera." "I dunno, I really like the necklace / t-shirt / hair you have. I want to get a picture with it." "Ok, we're actually having a contest with our friends to see who can get the most random pictures. Can we please?" The last 15% said no, but they were usually old. I felt kind of bad. Funny thing is, we almost dissuaded ourselves from doing this when we arrived at Times Square. Everyone was hemming and hawing, because of this latent negative thought: "Why would they agree to be in a picture with us? They don't even know us! We don't need to be bothering them." None of these concerns actually surfaced. It turns out human beings are more forgiving, more spontaneous, and nicer than we make them out to be. In the end, we ended up with 22 pictures in 10 minutes. That's a picture every 30 seconds. Considering it took 15 seconds to ask and take a picture, we basically moved from group to group. And, on the surface, it seemed like everyone was happy to acquiesce. Their day might even have become better as a result. Spreading happiness? Most definitely. Buoyed by our picture-taking success, we went on another challenge: phone numbers in 15 minutes. Needless to say, we weren't as successful, but I managed to grab one number (from Morocco; she speaks perfect French), and talked to two others, without subterfuge or false pretenses. But that's another story for another day.